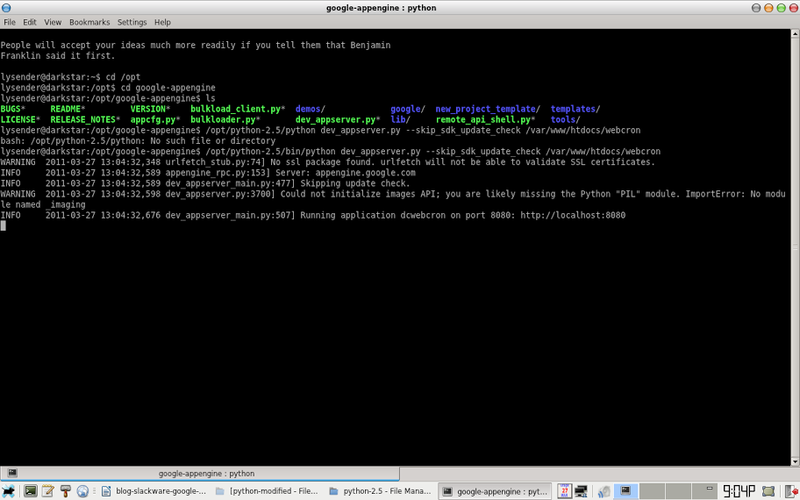 Currently, Slackware 13.37 RC2 has Python 2.6.6 and Google’s App Engine SDK for Python requires Python 2.5.x. After several days of contemplation, I decided to give it a try and installed Python 2.5.5 in parallel with Slackware’s stock Python. Since Google’s App Engine SDK for Python requires or at least more safe when using Python 2.5.x, I have no choice but to install one. While learning Python in general, I also need the latest stock Python from Slackware since other applications uses it like Frozen Bubble game. I will install the version 2.5.5 somewhere in /opt leaving the original Python intact. We can download Python 2.5.5 source from Python’s website. In Slackware, it is fairly easy to build any supported software however, there is so-called the Slackware way of building packages via Slackbuilds. Let’s call it Slackbuilding. The art of Slackbuilding includes a Slackbuild script that sets at a build environment, configure the source and creates a Slackware package. To make things easy, I look for the Python Slackbuild script from Slackware 12.2 source tree and modifies it a bit since it is for Python 2.5.2 and also contains several security patches. Python 2.5.5 is somewhat like the last release for 2.5.x series so it needs no patch of whatsoever. Enough for the overview and let’s get to work. First get the Python 2.5.5 source code from the Python’s website and put it somewhere, for example: ~/python-2.5.5. On the same directory, create this Slackbuild script. Below is a Python Slackbuild script derived from Slackware 12.2 source with minor modifications. # I'll assume that in this case it has been well tested. Save it on the directory where you copied the source code and name it python.SlackBuild. Be sure to put an execute bit by invoking chmod +x python.SlackBuild. Be sure to create first /opt/man-python-2.5. To run the Slackbuild script, on the current directory, run: ./python.SlackBuild as root. It will take several minutes. After several minutes of the build process, it must have created a Slackware package in /tmp/python-2.5.5-i486-1.tgz. When you install that in Slackware, there are still chances that it will override some stock Python files. That is because there is an install script doinst.sh in the resulting Slackware package that overrides some Python related files. What we need is to modify /tmp/python-2.5.5-i486-1.tgz and repackage again. 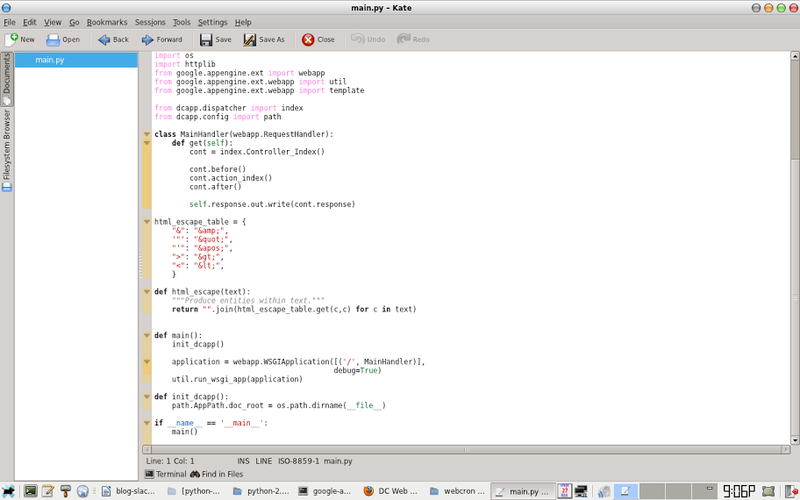 Copy the package somewhere, example: ~/python-install and extract the contents. What I just did was to remove some copying of files directly to /usr directory where it may override existing python binaries. which effectively repackaged it into a new Slackware package with custom install script and saves it to the parent directory. Finally, we now have ~/python-install/python-2.5.5-i486-1.tgz which is safe to install in our Slackware 13.37 (leet edition). Please note that all filenames mentioned above may not work when you follow step by step (not unless you login as root from the start). Adjust paths, versions and filenames accordingly. and it should say the correct version (2.5.5). Just get the Google App Engine SDK for python for Linux which is a zipped file. Extract it to the location you want to install it. I installed (extracted and renamed) them into /opt/google-appengine so that dev_appserver.py will be located at /opt/google-appengine/dev_appserver.py. 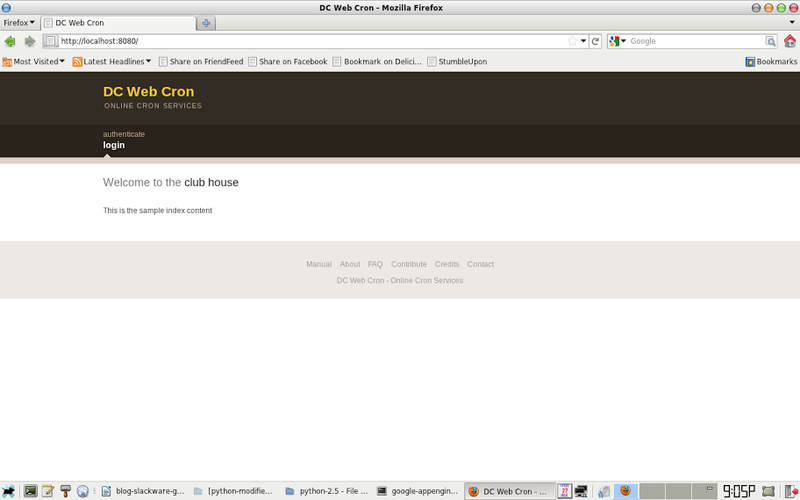 This entry was posted in AppEngine, Python, Slackware. Bookmark the permalink.